I'd like to dedicate this video to my friend and colleague David Keith. Over 30 years ago, David created a programme for children called Juniper. He and I facilitated this relationship/peace education programme in schools in Dumfries for several years. David has retired but his legacy lives on in my work. 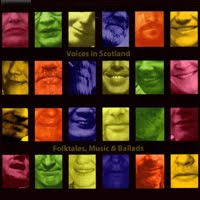 I'm pleased to announce the release of "Voices in Scotland - Folktales, Music & Ballads" on Brechin All Records (www.brechin-all-records.com). I am so honoured to be included along with some of Scotland's most talented storytellers, musicians and singers, including the late great Stanley Robertson. Kudos go to storyteller and musician Marion Kenny who produced this lovely double CD set. Thanks also to the Scottish Storytelling Centre and to Creative Scotland for their support. I would also like to thank the musicians Jean-David Cailloet (guitar/xylophone), Marion Kenny (flute/harmonium) and Joel Sanderson (cello) for their sensitive and imaginative accompaniment. May these stories warm your heart, kindle your imagination, and soothe your soul. I've posted a FREE .pdf file on my web site entitled "10 SECRETS OF A HEART-CENTERED STORYTELLER". Please follow this link and download the file for free. I hope you enjoy it. Please add your comments here or email me at iamthestoryteller[at]gmail.com. In an age where technology is both a boon and a bugbear, it's inspiring to see technology and creativity working together in a way that inspires children. This short video tells of an unique experiential learning project by Canadian storyteller and film-maker Lance Weiler. Learn how a plush toy robot from outer space will find her way home thanks to children in Montreal and Los Angeles. I've recently uploaded a story to Soundcloud (http://soundcloud.com/thestoryteller/01-the-story-of-kaminik). I call it the 'Story of Kaminik'. It's based on an Inuit legend and I learned it from Scottish storyteller and puppeteer Sylvia Troon a few years ago and loved it. Since then I've created my own version (still true to Sylvia's telling) and added bits here and there. 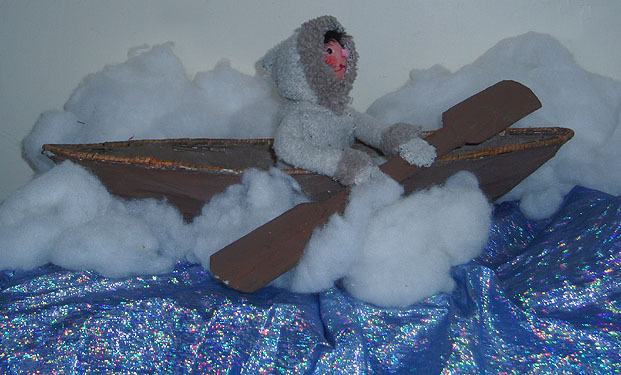 BTW, the photo is of Sylvia's Kaminik puppet with kayak. The recording is based on my recent performance on the last day of the International Book Festival in Edinburgh at the end of August. During my performance I was accompanied by pianist Seán Pugh (former member of 80s Liverpool band The Flock of Seagulls). Our intention was to improvise the interplay between words and music. I made Seán aware of places in the story where the mood shifted but we took a sort of "jazz" approach by allowing ourselves to respond to each other to create a unique performance. It was a success. The following week we went into Seán's studio and recorded this version of the story, again improvising the interplay between us. I love this way of working and I'm amazed by Seán's ability to improvise on my simple melody and to inspire me. I hope you'll enjoy the story as much as we did in making and performing it. I only ask that, if possible, you set aside the 30 minutes to listen to it in its entirety rather than a bit now and the rest later. I know they say this is the age of short attention spans, but if 75 pre-schoolers could sit there entranced through the entire show, I'm sure you can too. I'd appreciate your thoughts and feelings afterward if you care to share them. It is said that we are made up of all the stories told about us, including those we tell about ourselves. Understanding those stories may lead to a better understanding of who and what we are. For the past several years, I've been offering story coaching and mentoring to those interested in using storytelling to enhance their personal or professional lives. Whether you're a beginner or a seasoned professional, my coaching and mentoring can improve your storytelling skills and techniques as well as deepen your emotional and spiritual connections with your 'inner storyteller' and the stories you want to tell. I also offer story coaching and mentoring for leadership and well-being. If you're an aspiring or established leader or, if you want to explore how "story medicine" can improve your health and well-being, contact me to learn more. I offer two ways of working together: (1) If you live in or near Edinburgh Scotland, I can meet you in one hour face-to-face meetings; or, (2) if you live further afield or abroad you can work with me via one hour Skype sessions. For further information or to book a session, contact me at iamthestoryteller@gmail.com. Michael Williams, Ph.D. is a professional storyteller, story coach & mentor, teacher, child care worker and education consultant with more than 30 years of experience working with children, teens and adults. He has been awarded five academic degrees and diplomas in English Literature, Language, Local History and Child Care Work from institutions including Edinburgh University and University of Oxford. He is a former Senior Tutor in English Literature at Edinburgh University, Principal Teacher of English at the Edinburgh Rudolf Steiner School and Secretary of the Scottish Parliament's Cross-Party Group on Creating a Culture of Peace in Scotland. He is currently the Editor of 'Therapeutic Storytelling', part of the All Things Healing online community, an Adviser and Assessor for the General Teaching Council of Scotland's Chartered Teacher programme and an accredited Peace Education facilitator who has worked extensively in primary and secondary schools as well as residential care centres and hospitals. In 2009, Michael was invited to join an international group of storytellers on a 'Healing Words' tour of the Holy Land where he worked with groups of Arabs and Jews using storytelling as a means of encouraging dialogue and mutual understanding. The following year he was appointed at Storyteller-in-Residence at MUSEartspace, a community gallery in Charlottetown Canada where he worked with children and adolescents and coached adults in storytelling. In the summer of 2011, Michael travelled to Denmark to learn more about 'narrative medicine' with Native-American psychiatrist and storyteller Dr Lewis Mehl-Madrona. He is an author, musician and performed on the closing day of this year's International Book Festival in Edinburgh. He is currently working with the Church of Scotland's Christian Fellowship of Healing and maintains a busy schedule of story coaching & mentoring with groups and individuals. Michael has been supported in his work for the past three years by Creative Scotland. Learn more at www.rjmwilliams.co.uk. In my experience, I've witnessed the power of story to change people's lives. Change the story you're telling yourself and others about how you see the world and you open the possibility of changing yourself. If the story isn't serving you any longer, then it might be time to re-examine that story. As the author of this article states, "The tales we tell hold powerful sway over our memories, behaviors and even identities." In this article from the American Psychological Association, Sadie Dingfelder looks at some of the latest research in 'narrative psychology' and reports on how story is changing lives. Having worked with Dr Lewis Mehl-Madrona this past weekend in Denmark, I am even more convinced and confirmed in the work I've been doing for more than thirty years as both a counsellor, literary academic, teacher, mentor and storyteller that narrative is the key to good health and well-being. Read the article, learn more and decide for yourself. Please get in touch and share your experience. The famous Scottish distillery Grant's Whisky is sponsoring a 'True Tales' storytelling competition. The finalists have been chosen and all that remains is for you to watch, listen and enjoy . . . then vote for your favourite. A winner will be chosen on September 15th. Living here in Scotland, I know that a good whisky, like a good story can warm the heart. Grant's has been sharing its story for more than five generations and is passionate about supporting the art of storytelling in others. Even if you're not a whisky drinker, you can still enjoy a good story so check out the 'True Tales' Facebook site at http://on.fb.me/mC7kew, sit back and enjoy the storytellers and their tales. Then vote for your favourite. My personal favourite is told by Ronald. It's called 'Northern Line' and tells a tale of love won, lost and won again. Like Ronald, I'm a romantic so just couldn't resist this charming tale. It certainly warmed my heart and left me with a smile on my face. Remember . . . drink responsibly; the story will be better for it. I'll be doing two performances: 10:30am-11:15 and 3:00-3:45 on Monday August 29th at the International Book Festival in Edinburgh. My friend Seán Pugh (remember Flock of Seagulls) will be providing the stories with some musical accompaniment. While out walking, I watched these two swans rapidly glide toward one another then nuzzle and form this heart-shape . . . they shared a story heart-to-heart before parting . 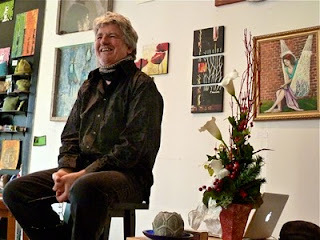 . .
Film-maker Nic Askew's SoulBiograhies site (www.soulbiographies.com) is an example of great storytelling that heals. Each of his short films pays testimony to the courage of individual men and women to share their story of the journey they've been on. Do yourself a favour and make the time to experience these stories. THE GIRL WHO LOOKED INTO THE MIRROR from Nic Askew on Vimeo. This month sees Michael return to the National Museum of Scotland to share stories and the Museum's 'mystery collection' with wee ones from local nurseries and primary schools. Later in the month, he will engage groups of teenagers at the Scottish Parliament where his mission will be to encourage young people to share their vision and story for Scotland's future. And, in recognition of Fathers' Day, he's co-facilitating a workshop with storytellers Tim Porteous and James Spence which will help fathers discover their 'inner storyteller' and share tales with their children. 7, 8, 9 June: Stories for Wee Ones, National Museum of Scotland, Chambers Street, Edinburgh. 17 June: Political Voices, Storytelling at the Scottish Parliament for young people, Scottish Parliament, Edinburgh. Sue and I have decided to offer this first 'Mythical Yoga' workshop for free (donations welcomed). The focus is on the elements--earth, water, fire, air and spirit--through storytelling and yoga. Utilising creative activities and drawing on stories from a variety of traditions, we will open the door for you to explore the meaning of the elements within your own life. Sue continues the experience with gentle, yet deep reflective yoga practices exercising body, mind and spirit. All levels of yoga experience (or none) are welcome. Please bring a journal, pen and a sense of adventure Mats and blankets provided. FACILITATORS: Yoga/holistic therapist Sue Powell and storyteller Michael Williams. Other dates to be offered in the autumn. COST: FREE (donations welcomed to help cover our costs). CONTACT: To register or for more info, contact Michael at iamthestoryteller[at]gmail[dot]com. In 2009 I had the privilege of travelling to the Holy Land with a group of international storytellers. Over the next few weeks we worked alongside Arabs and Jews, Israelis and Palestinians - using storytelling as a means of encouraging deeper dialogue with one another. I was so impressed with the commitment and passion for peace on both sides. I met many like Juliano Mer Khamis, whose passion for freedom and peace was leading a new generation of children toward a better, more positive life. Sadly, Juliano was murdered a couple of weeks ago. A friend of mine from Palestine informed me and asked that we open our hearts to his vision and to the challenges that remain. I wanted to highlight this video produced, directed, shot and cut by Ben Aylsworth, Lisa Fender, Tareq, Mustafa, Ahmed and Muhammed. May it be a tribute to Juliano and the children of the Freedom Theatre in Jenin and a reminder of the importance their (and our) stories. The expression of our stories is a fundamental right and cannot be silenced. Everytime I see or hear Brother Blue perform, I am inspired. He was a very special human being--like we all are--and he is sorely missed. I wish I had met him, but his story lives on. The Call of Story examines the power of storytelling through six of America's finest storytellers as they share powerful family tales. Each story is framed by a short testimonial explaining the narrator's impressions and feelings about the significance of story in their family lives. Approximately an hour in length. Thanks to the website globalvoicesonline.org, stories from ordinary people around the world can be read and heard. Global Voices is a network of more than 300 bloggers who report on blogs and citizen media from around the world. In Japan, for example, this online community is working to translate stories from Japanese survivors into English and other languages so their stories can be understood and appreciated by a larger global community. Join Canadian Michael Williams and local lass Fiona Campbell to hear all about the journey of an eighteenth century family emigrating from Scotland to Canada. A performance filled with traditional stories and music which have transcended national boundaries. With songs to join in and objects to handle, these sessions are suitable for all ages. I'm writing this less than two days after a massive earthquake literally shook and shifted Japan eight feet across the crust of the earth and for a massive tsunami to wash over the land, destroying everything in its path. Homes, offices, buildings, cars, trucks, trains, ships were literally uplifted and pushed miles inland. Cities, towns and villages smashed and drowned and smeared with tons of debris. Human life left in chaos. The images we have seen beggar belief, the reality of human order rendered senseless: ships, trains, vehicles, houses and buildings tossed about like toys. The ocean racing relentlessly across fertile fields and farmland drowning everything in its path. The aerial views belie the speed at which the tsunami sped across the ground. Racing at over hundred miles per hour, there was no chance of escape. It seems too soon to even attempt to makes sense of it all; yet, we try. Geologists are brought on tv to explain how the earthquake and tsunami were created. One explains that the very forces within the earth that helped spark life are the same forces that ended it. Another tells us that such quakes are inevitable and to be expected. Still other pundits talk of 'acts of God' and the 'power of Nature'. We're reminded how fragile human life is, clinging as it were, to this thin crust of a dynamic, changing earth. We may think we are 'lords of the dominion', yet such natural calamities reminds us how fragile and tenable is our grasp. The experiences of people caught up in the disaster also become an important part of its telling. Journalists report on the facts as well as their experiences 'in the field'. Survivors are brought on to share their stories and videos. Words like 'unbelievable', 'incredible', and a whole host of superlatives are used. Yet many still seem traumatised, not quite understanding fully what has happened to them, their loved ones and neighbours. In many instances, words are inadequate. The tellers are rendered speechless. Yet the fact remains that we need to tell our stories and to encourage others to tell theirs. By sharing them, we can begin the healing. Stories are in integral part of the grieving process. By attempting to make sense of our pain, fear and loss we can better understand and contextualise what has happened. Even those of us who are living this experience vicariously through the medium of television or internet need to share and re-tell the stories to one another. Facebook and other social digital media enable us to share from one end of our 'global village' to another. Sharing stories with one another reminds us that we are part of a human community, that we need one another to survive. Yes, natural disasters have happened many times in the past and they will continue long into the future. They can happen anywhere and anytime to anyone. And when the earth shakes in one part of the world, we are all shaken. But by sharing our stories, by listening compassionately to one another, we can all begin the long journey ahead toward recovery and renewal. Blessings on our sisters and brothers of Japan.